Author, curator and architecture and design editor Zahid Sardar, who is also the Editor-in-Chief of SPACES magazine, will offer examples from his new book, In & Out of Paris: Gardens of Secret Delights. The book explores historic estates such as Vaux Le Vicomte and Versailles, the transformation of Park Monceau under Baron Hausmann, as well as new private Parisian gardens and repurposed sections of Paris, including viaducts that were transformed into elevated gardens long before New York's High Line took shape. 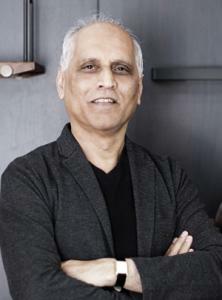 Zahid Sardar is a San Francisco curator, editor and writer specializing in architecture, interiors and design and the editor-in-chief of SPACES magazine. His work has appeared in national and international publications including the New York Times, Dwell, Form, Interiors, Interior Design, House Beautiful, Elle Décor, San Francisco, and Silicon Valley magazines, and the San Francisco Chronicle for which he served as architecture and design editor for twenty-two years. Mr. Sardar has lectured on the history of interiors at the California College of the Arts (CCA) for four years. The 2015 exhibition he curated, Hands Off: New Dutch Design at the Confluence of Technology & Craft, was shown in San Francisco at the Museum of Craft and Design and later, during Eindhoven’s Dutch Design Week in The Netherlands. He is also the author of several architecture and design books, including San Francisco Modern, New Garden Design, West Coast Modern: Architecture, Interiors and Design, 100 Best Bikes, The Dutch Bike, and his most recent, In & Out of Paris: Gardens of Secret Delights. Escape the cold Washington winter and immerse yourself in the stories of luscious garden estates.